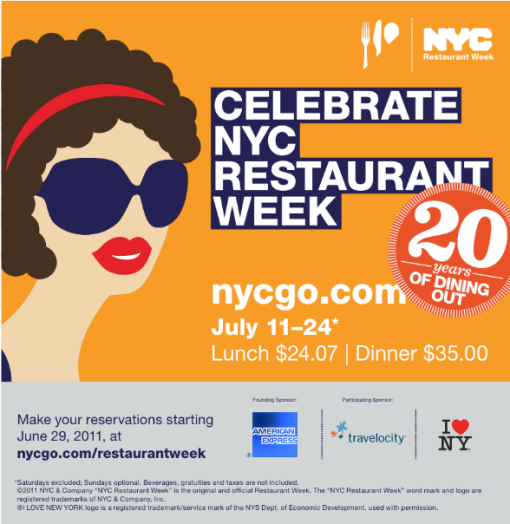 Hey, just a reminder that NYC Summer Restaurant Week starts on Monday, July 11 in NYC and runs until July 24. Three course dinners are $35 and three course lunches are $24.07, find a list of participating restaurants is over here. Advance reservations are highly recommended (if not required in most cases), Saturdays are excluded; Sundays are optional. As an added bonus this year, you can receive get a $20 statement credit when you register and use any eligible American Express Card to dine out three or more times at participating restaurants during NYC Restaurant Week.